Steve Dawson and Liz Slooten, both Professors at Otago University, started the sperm whale research programme in Kaikoura in 1990. 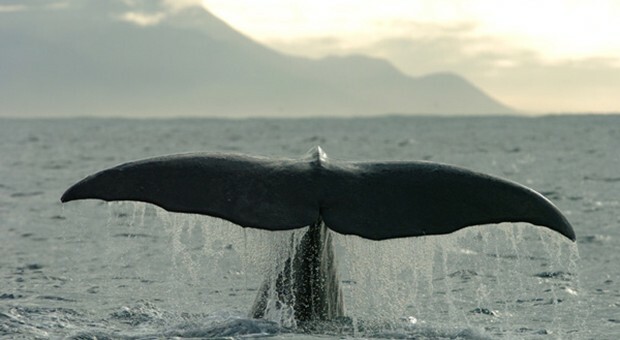 Since then, the NZ Whale and Dolphin Trust has supported research on population size, behaviour and ecology, development of new acoustic techniques to locate and survey sperm whales and assessments of the impacts of tourism. A new, three year research project has just been funded by Whale Watch Kaikoura. This project will assess the foraging ecology of sperm whales at Kaikoura. The project will be carried out by researchers from the University of Otago, including Marta Guerra and Will Rayment. 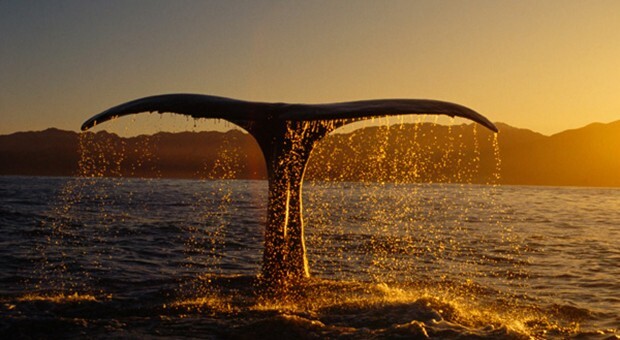 It is funded by Whale Watch Kaikoura in conjunction with the New Zealand Whale and Dolphin Trust. We aim to answer questions such as: ‘What sustains the diet of sperm whales in the Canyon? What areas are good for searching for food? What makes these areas so productive?’ As part of the long-term study we will also produce an updated estimate of sperm whale abundance at Kaikoura, a crucial step to assess population trends and long-term survivability. Photo: Marta Guerra deploying a CTD instrument to measure water temperature and salinity. Sperm whales are found close to shore off Kaikoura year-round. They support a thriving whale watch industry. Generally, the Kaikoura sperm whales dive for about 40 minutes and then spend about 10 minutes or so at the surface. Each whale has a unique combination of scallops and nicks in the trailing edge of their tail flukes. By photographing the flukes when whales dive, we can identify each individual. We’ve known some individual whales for over 16 years. Sperm whales make very powerful clicking sounds (in fact the loudest sound made by any animal) to find food. They click, on average, twice a second, about 50-70% of their time underwater. We use these echolocation sounds to track the whales, and by using several hydrophones we can figure out how deep they dive, and how they find prey – without having to attach any kind of tag to the whales. While sometimes they dive to more than 1000m, mostly they forage for squid at around 500m. We’ve also studied how they react to whalewatch boats. While some whales are very tolerant of boats, others react with sudden turns and changes in speed, as well as changes in the length of time the whales spend at the surface and their breathing pattern. A 10-year moratorium on new whale watching permits was implemented in response to our research. Sperm whales are among the most vocal whales and dolphins, producing their characteristic clicks between 50 and 70% of the time. Their vocal behaviour presents a powerful way of investigating their underwater behaviour. Usual clicks: A sequence of loud clicks, with regular spaces in between – these sound like a loud metronome. Creaks or buzzes: A very fast sequence of clicks that sounds like a buzz, a loud purring sound or a creaking door – these clicks are usually much less loud than normal clicks. As whales close in on a prey item, they increase their click rate to get as much information as possible. When the click rate gets very fast, it sounds like a buzz. Codas: Consistent patterns of clicks such as four clicks, a break and then another click (4+1). A wide range of these sounds are made by sperm whales and each whale population has its own most popular coda types. Some populations favour evenly-spaced sequences of 5, 7 or 8 clicks, others favour sequences like 4+1 or 5+1. These are social sounds most often heard on the breeding grounds. We only occasionally hear them at Kaikoura. Slow clicks or surface clicks are very loud clicks, several seconds apart, and usually made in a short sequence of just a few clicks (and sometimes only one). 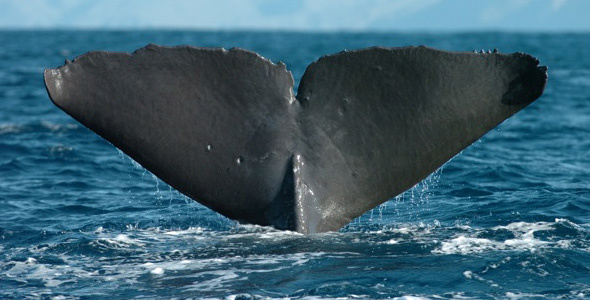 These are commonly heard off Kaikoura, but appear to be rare in other populations. Their function is still a mystery. In Kaikoura these loud clicks are often the last clicks made by a whale just before it surfaces. The whales’ sounds make it possible for us to locate them in 3 dimensions underwater. Since sperm whales typically spend 80% of the time diving, they are easily missed by visual surveys. On the other hand, sperm whales click almost continuously while diving. Acoustic research methods are the obvious way to go with an animal like this. For example, there has been a trend towards developing methods to use sounds produced by sperm whales to census them acoustically. 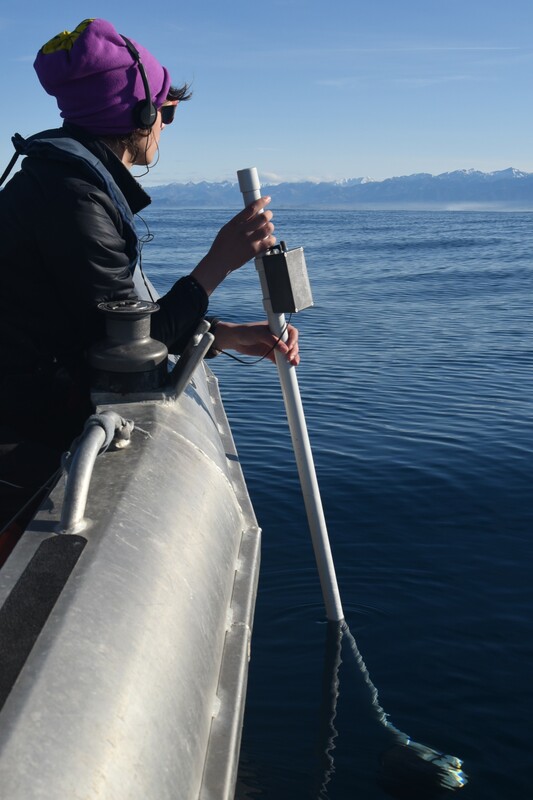 Photo: Tamlyn Somerford using a directional hydrophone to track whales. We use directional and omni-directional hydrophones, both of which we build ourselves. A directional hydrophone is used to find out the direction to the whale and to track the whale throughout its dive cycle. ID photographs of the whale’s tail are taken when the whale dives. Special software has been developed at University of Otago to analyse sperm whale sounds and in particular to determine their location in 3 dimensions (latitude, longitude and depth). The figures above show sperm whales at Kaikoura undertaking active foraging dives. Each upper plot show a whale’s location on a map or chart, as if seen from above (e.g. from a helicopter). The sea floor is shown as contours in the upper plots – just as you would plot the height of a mountain on a map. In the lower plots, the seafloor is shown as grey shading. The lower plot shows the depth for each of the above dives, from the beginning to the end of the dive. 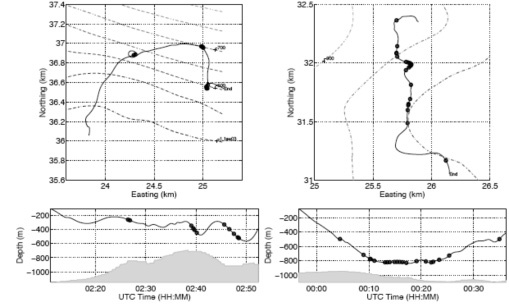 In the two plots on the left, the whale (individual NN20) takes sharp turns and makes relatively steep dives and upsweeps. The whale on the right, (individual HL160) dives deeper and keeps a relatively stable course, both in terms of horizontal direction and dive pattern. The dots indicate where the whales used fast echolocation buzzes, in other words, where the whale found food. Another remarkable thing about whales clicks is that they reveal the size of the whale that made them. The clicks are made by an organ at the front of the head. Each click also travels backwards inside the head, and is reflected forwards again by an airsac in front of the skull. From a whale’s click you can measure the delay of the reflected pulse – which tells you the length of the whale’s head! We’ve also developed was to measure whales photographically – using a stereo camera system we built. With a properly set up stereo camera system you can measure in 3D anything in the combined field of view of both cameras. So, as the whale is breathing at the surface, recovering from a long dive, we can gently come alongside 50m away and shoot stereo pictures showing the blowhole and the dorsal fin. From whaling data, we know that this is almost exactly two-thirds of the whales total length. Combining the acoustic work with the stereo photography we can measure the actual size of a whale in real time. Trust researchers have developed software to do his automatically. While we are listening to a whale, the computer tells us how big it is. In the next three years we will find out more about the feeding ecology of Kaikoura sperm whales. Large predators have high energy requirements so they spend a lot of their time and effort searching for prey. Their quest for food strongly influences what they do on a day to day basis: from the movements and distribution of a certain population to the evolution of incredible feeding mechanisms. The submarine canyon of Kaikōura is an enormously productive deep-sea habitat, and serves as an important feeding ground for male sperm whales which are found there year-round. Sperm whales require of up to 1.5 tons of food per day and they routinely dive to depths of hundreds of metres in search of their prey. Exactly what they eat at Kaikōura remains unknown. Figuring out the diet of these animals will allow us to identify their role in the ecosystem, as well as better understanding their movements and distribution. But how do we learn what these animals eat if they spend most of their time at great depths and don’t feed at the surface? One way is by examining the components of tiny pieces of sloughed skin. In a chemical demonstration of ‘you are what you eat’, the isotopic composition of a predator is determined by the isotopic make-up of its prey. By analysing the isotopic signatures of tissue from sperm whales and potential prey (including different types of squid and fish) it is possible to reconstruct the structure of a food web. We can also investigate how sperm whales might change their diet from season to season. Getting our hands on samples of whale skin is a tale of persistence and patience. When a sperm whale dives, tiny strips of sloughed skin often remain at the surface – but they are difficult to spot. We keep our eyes open for them and scoop them up with a net. Later on, stable isotope analysis can be carried out at the laboratory. Where do sperm whales search for their food? Understanding where sperm whales look for food – and what makes these areas good hunting habitat – will help us better understand their habitat requirements. This is useful for understanding their relationship with their environment and providing guidance for their future protection. Thanks to past research at Kaikoura we know that sperm whales prefer to forage in some areas more than others. For example, whales appear to be concentrated over the canyon in summer, whereas they have a more wide spread distribution in winter that includes shallower areas. While the movements of sperm whales are likely to reflect that of their prey, we don’t know what factors drive this relationship. By relating the positions of foraging whales to important physical and biological variables, we can determine which combination of factors make the most suitable ‘hunting grounds’. To characterise these variables we carry out oceanographic measurements of temperature, salinity and phytoplankton productivity, in addition to using information about the depth and steepness of the seafloor. Liz manoeuvres the boat while Abe takes a stereo photo of a whale 50m away alongside. 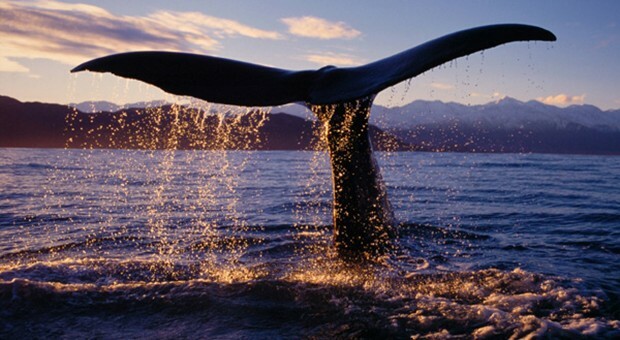 There is increasing pressure from a few countries to resume commercial whaling. In addition, New Zealand sperm whales are vulnerable to the usual other threats, including the use of fishing gear in their habitat. We have seen a sperm whale off Kaikoura with a piece of a gillnet trailing from it. Trawling off Kaikoura, and especially on the Chatham Rise, has impacted on fish species that are part of their diet. And then there is tourism. Sperm whales off Kaikoura support a thriving whale watch industry. On an average summer’s day, whale watching boats are present for about 40% of the surfacings of the whales found close to shore. Behavioural responses to the presence of whale watching boats include sudden turns and changes in speed, as well as changes in the length of time the whales spend at the surface and their breathing pattern. When they dive, they stay silent for longer than whales without whalewatch boats. Further research aims to find out the ecological importance of these behaviour changes. To find whales as quickly as possible, and conserve fuel, whalewatch skippers prefer to target the whales found close to the Peninsula. These whales are typically “residents”, meaning that they stay in Kaikoura waters for several weeks or months at a time, and come back to Kaikoura regularly. They have become tolerant of boats, and provided the boats obey the rules, very obvious changes in behaviour are uncommon. The most obvious responses are shallow dives – the whale disappears for just a few minutes and resurfaces nearby. For resident whales, the most common cause of this is a head-on approach by a boat. Sperm whales find this threatening, and almost always turn away or dive. The whale-watch skippers are usually pretty good, and approach slowly from behind. But no-one is perfect, and sometimes whales pop up unexpectedly. There are other sperm whales that visit Kaikoura only for a few days, then continue on their journey. We call these “transients”. Usually they do not come so close to the Peninsula, and they are much more wary of boats. Indeed for some of them it is difficult, even with very considerate boat driving, to get close enough to get an ID photo. It seems odd that the world’s largest active predator should be so easily spooked. Even the most tolerant sperm whales are not really boat-positive. Unlike humpbacks or right whales, sperm whales very seldom approach boats of their own accord. Current research: Are there fewer sperm whales in Kaikōura? The abundance of sperm whales feeding at Kaikōura has almost halved over the last two decades, but the causes for this decline are unknown. In the next three years, we will produce an updated estimate of population size, and assess population trends. 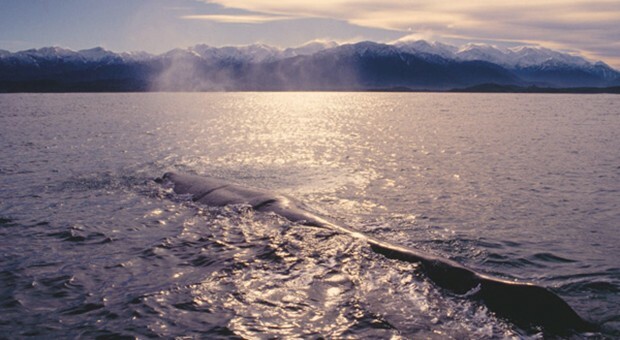 Changes in sperm whale numbers at Kaikōura since 1990 will be related to variations in the oceanographic conditions in the area over the years. This way, we can investigate if any changes in the marine environment could have affected the unique ecosystem of the Kaikoura submarine canyon and the sperm whale population it supports. Whale watching: Our ecological research on the whales at Kaikoura has provided the basic understanding needed to protect this local population. In response of our research specifically on the effects of tourism on sperm whales in Kaikoura, the Department of Conservation placed a 10-year moratorium on further whale watching permits. Undermining whaling: Japan defends its “scientific” whaling by saying that lethal research is needed to be able to understand whales. We’ve spend a lot of our research effort showing that this is simply not true. We’ve developed acoustic survey methods not only to find whales but track them in 3-D, and we can identify, measure and even chart the growth of individual whales – without ever having to touch them. Using a dip-net to collect small pieces of skin, that are sloughed off naturally as the whales dive, provides samples of DNA. Stable-isotope analysis of these samples also provides information on what the whales have eaten. While Japan mostly takes minke whales, they take some sperm whales each year as part of their “scientific” whaling programme. We, and others, have shown that this is completely unnecessary. On these ID photos we are looking for the shape of the tail – especially the nicks and cuts in the trailing edge of the tail flukes. Childerhouse, S.J., Dawson, S.M. and Slooten, E. 1995. Abundance and seasonal residence of sperm whales at Kaikoura, New Zealand. Canadian Journal of Zoology 73: 723-731. Childerhouse, S.J., Dawson, S.M. and Slooten, E. 1996. Stability of fluke marks used in individual photo-identification of sperm whales at Kaikoura, New Zealand. La Jolla, U.S. 3pp. January 2007. Dawson S.M. Notobartolo di Sciara, G. 2007. Some comments on the Draft Sperm Whale Assessment. IUCN IUCN assessment workshop. Endangered Species Research. 10:333-339. Dawson, S.M. 2005. Acoustic and ecological research on sperm whales at Kaikoura, New Zealand. Cachalot Assessment Research Planning Workshop, Woods Hole. Dawson, S.M. 1993. Science in progress on sperm whales at Kaikoura. Annual DOC workshop on Marine Mammals. Wellington. Dawson, S.M., Chessum, C.J., Hunt, P. and Slooten, E. 1995. An inexpensive, stereo-photographic technique to measure sperm whales from small boats. Reports of the International Whaling Commission. 45: 431-436. Dawson, S.M., Slooten, E. and Chessum, C. 1991. Where, how many, how big? Some new methods developed to study sperm whales. New Zealand Marine Sciences Society Conference, Wellington. Douglas, L., Dawson, S.M. and Jaquet, N. 2005. Click rates and silences in sperm whales at Kaikoura, New Zealand. Journal of the Acoustical Society of America 118(1): 523-529. Growcott, A., Miller, B., Sirguey, B., Slooten, E. and Dawson, S.M. 2011 Measuring sperm whale body length from their clicks: the relationship between inter-pulse-intervals and photogrammetrically measured lengths. Journal of the Acoustical Society of America. 130: 568-573. Jacquet, N., Dawson, S.M., and Douglas, L. 2001 Vocal behaviour of male sperm whales: why do they click? Journal of the Acoustical Society of America. 109 (5): 2254-2259. Jäke, O. & Dawson, S.M.Acoustic censusing of sperm whales at Kaikoura, New Zealand. Journal of the Acoustical Society of America. Vol.105, No.2, Pt.2. Jaquet, N., Dawson, S.M. and Slooten, E. 2000 Abundance, occupancy and seasonal distribution of male sperm whales off Kaikoura, New Zealand. Canadian Journal of Zoology. 78: 407-419. Letteval, E., Richter, C.F., Jaquet, N., Slooten, E., Dawson, S., Whitehead, H., Christal, J. and McCall Howard, P. 2002 Social structure and residence in aggregations of male sperm whales. Canadian Journal of Zoology. 80: 1189-1196. Rhinelander, M.Q. and Dawson, S.M. 2004 Measuring sperm whales from their clicks: stability of inter-pulse intervals and validation that they indicate whale length. Journal of the Acoustical Society of America. 115(4): 1826-1831. Richter, C. & Dawson, S.M. 2002 Impact of whale watching on sperm whales at Kaikoura. Impact of whale watching on sperm whales at Kaikoura. Richter, C., Dawson, S.M. and Slooten, E. 2002 Impact of whale watching on sperm whales at Kaikoura. Final report. Department of Conservation research investigation 2370. Richter, C., Dawson, S.M. and Slooten, E. 2006 mpacts of commercial whale-watching on male sperm whales at Kaikoura, New Zealand. Marine Mammal Science. 22: 46-63. Richter, C., Slooten, E., Dawson, S.M. and Jaquet, N. 2001 Behavioural differences in responses to whalewatching vessels by resident and transient male sperm whales off Kaikoura. Fourteenth Biennial Conference on the Biology of Marine Mammals. Vancouver, Canada. Richter, C.F., Dawson, S.M. and Slooten, E. 2003 Sperm whale watching off Kaikoura, New Zealand: Effects of current activities on surfacing and vocalisation patterns. Science for Conservation. 219: 5-78. Dawson, S.M. 2003. Sperm whales: Kaikoura and beyond. Otago Yacht Club. Dawson, S.M. 1995. Kaikoura’s sperm whales. Kaikoura Memorial Hall. Dawson, S.M. 2000. Building directional hydrophones to find sperm whales. Half-day practical workshop at Kaikoura Tours Ltd, Kaikoura. Groups in the “orange” category either favour compromise options, or it is not clear what dolphin protection they support. Compromise options include protection for Maui dolphins to 12 nautical miles offshore and some additional protection for the smallest and most endangered populations of Hector’s dolphins. This would cause continued fragmentation of Hector’s and Maui dolphin populations.